Who was shopping in Chatt back in 1913? And what were they buying? A while back I was given a few books that give just that information. Last year Jerry Miller gave me some old ledger and day books that had been stored in his mother’s attic. These old books had been in Glen and Catherine Miller’s attic for years, likely years before the Millers purchased the house in Chatt after they married in 1945. 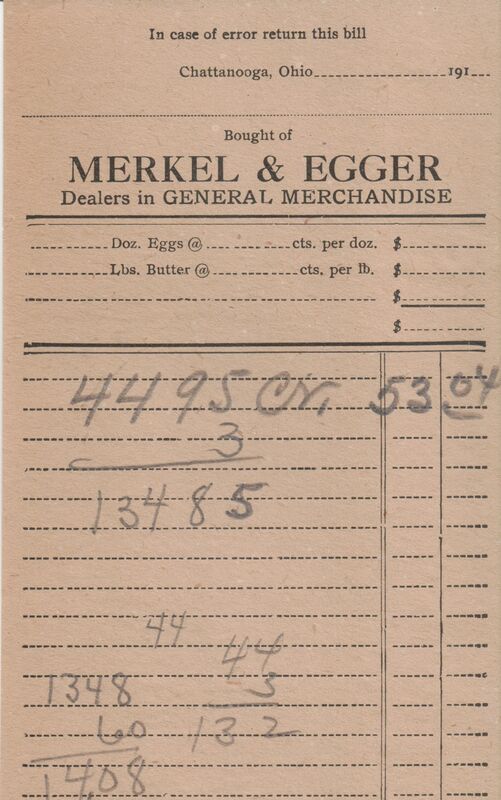 Chatt General Store Ledger 1913-14. In 1921 Clarence Vining and his wife Effie built the house that the Millers later purchased, where the Millers lived all their married life. At one time Vining had a general store in Chatt and these were the ledgers and day books used for Chatt’s General Store. In 1910 Clarence Vining was a school teacher  and by 1916 he had turned to farming in Black Creek Township. By 1917 he changed careers again and was employed as a groceryman in Chattanooga. So it appears Clarence started running the general store sometime between 1916 and 1917. In1920 Clarence Vining, age 32, gave his occupation as a merchant in a general store. The store was probably just south of the Chatt Bar. Vinings built the house on the north end of Chatt in 1921 and he and Effie lived there, next to Perry Gibbons, who ran the Chatt Bar. The oldest ledger book from the Miller attic is for the years 1913-14, before Clarence Vining became a general store merchant. So who owned and ran the Chatt General Store in 1913 if it wasn’t Clarence Vining? Probably Leo Merkle and Semon Egger. 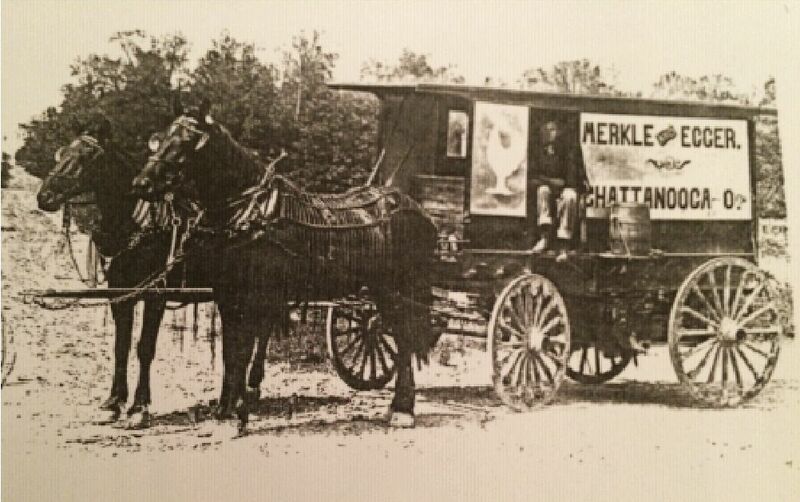 Merkle & Egger ran a general store in Chatt in 1916  and probably before that. 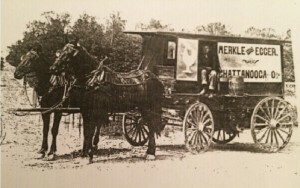 Leo Merkle, 21, was a clerk in a general store in 1910. Semon Egger, 19, was a wagon driver at the same time  and may have driven the huckster wagon for the store. Yes, this was probably Merkle & Egger’s ledger book. 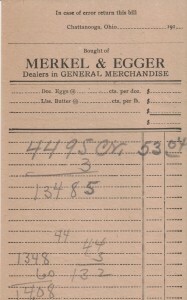 Merkel & Egger receipt from their general store in Chattanooga. When Clarence Vining took over the store in 1917 he likely ended up with the accounting books, too. Vining ran the general store in Chatt for about ten years, but by 1930 Clarence and Effie had moved to Celina, where Clarence became an assistant cashier at a bank. They sold their house to Clark Sipe and the Millers purchased it several years later. And the old books remained in the attic of the home for nearly 100 years. Until last year. The stack of old books from the Miller attic includes three ledger books and four Day Books. The ledgers were for keeping track of balances owed and payments made by individuals and a few businesses. There is an index in front of the ledger books which lists the customer’s name, followed by a page number. The customer’s account information is on that page farther back in the book. It looks like quite a few people bought things on credit, even back then. 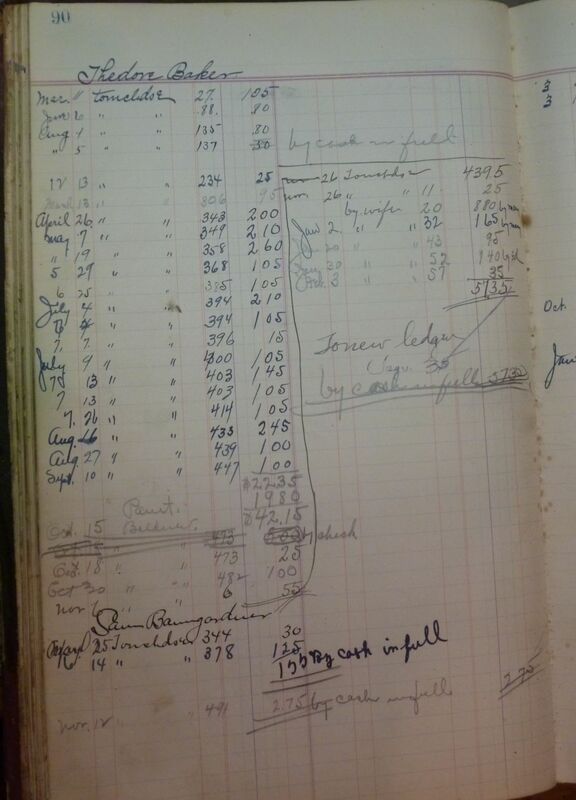 Most accounts were paid in full but some balances were carried over to a new ledger book. 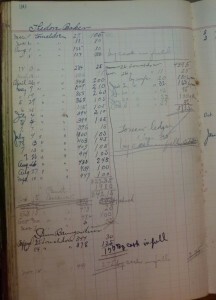 Chatt General Store Ledger Book, 1913-14. 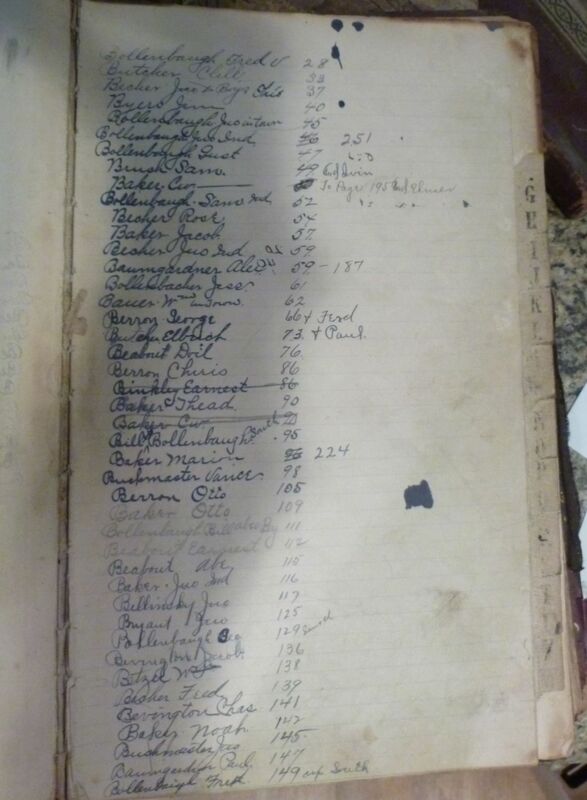 The index in this ledger indicates who was shopping in Chatt’s general store in 1913-14. It is interesting to see how the store owners differentiated between individuals with the same name. For example, the Bollenbaughs were identified by where they lived—in town, Indiana, south, etc. Inside the front cover is penciled Total 1188.23. Possibly total receipts for those years? Not indexed, but at the end of the book on pages 399 & 400, are entries for Leo Merkle. There is another interesting connection between the old store books, the Vinings, and the Millers. Catherine (Leininger) Miller’s mother Carrie Becher did housework for the Vinings in Chatt. Ted Leininger drove the huckster wagon for Clarence Vining at the same time and that is how Ted and Carrie met. They married in 1918 and Ted farmed after that. We’ll look at a couple more of the old general store ledger books from Chatt next week. 1910 U.S. Census, Black Creek Township, Mercer, Ohio, ED 107, p. 9A, dwelling 187, family 188, Clarence L Vining; digital image by subscription, Ancestry.com (www.ancestry.com : accessed 14 August 2014); from FHL microfilm 1375227, from NARA microfilm T624, roll 1214. The Farm Journal Illustrated Directory of Mercer County Ohio (Philadelphia, Pennsylvania : Wilmer Atkinson Company, 1916), 69, 113, 152, 173. “U.S. World War I Draft Registration Cards, 1917-1918,” digital images, Ancestry.com (www.ancestry.com : accessed 14 August 2014), card for Clarence L Vining, no. 1390, Mercer County, Ohio; citing World War I Selective Service System Draft Registration Cards, 1917-1918, NARA microfilm publication M1509, imaged from FHL roll 1832519. 1920 U.S. Census, Liberty Township, Mercer, Ohio, ED 140, p. 2B, dwelling 33, family 33, Clarence Vining; digital image by subscription, Ancestry.com (www.ancestry.com : accessed 14 August 2014); from NARA microfilm T625, roll 1418. 1910 U.S. Census, Liberty Township, Mercer, Ohio, ED 119, p. 15B, dwelling 337, family 297, Rev. Samuel Egger; digital image by subscription, Ancestry.com (www.ancestry.com : accessed 14 August 2014); from FHL microfilm 1375227, from NARA microfilm T624, roll 1214. 1930 U.S. Census, Jefferson Township, Mercer, Ohio, ED 5418, p. 12A penned, 177 stamped, dwelling 290, family 299, Clarence L Vining; digital image by subscription, Ancestry.com (www.ancestry.com : accessed 14 August 2014); from FHL microfilm 2341584, from NARA microfilm T626, roll 1850. This is very interesting to me. Clarence Vinings and my great uncle Floyd Vinings were brothers. Floyd and his wife Hazel Carr Vinnings left Chatt and moved to Buckly Michigan where they lived untill their deaths. They were brought back to East Bethal Cemetary on 707 where they were intered. Also Effie Vinings worked as a midwife and she was the one that helped deliver my grandmother Kathryn Carr Black. Grandma was actually named for Effie and her given name is Effie Kathryn. Always enjoy these posts. Thank you for the additional information, Brian. How interesting. I don’t believe Clarence and Effie had any children. One census enumeration indicated that she had given birth to one child but the child was not living. East Bethel Cemetery is just down the road from where I grew up. I’ll have to stop and get a photo of their tombstone sometime. How cool to have a unique resource like this, Karen! So interesting. Yes, they are great source of information, Shelley. And I have more of them! I am fortunate that he thought of me and gave them to me. There is alot of my Carr relatives buried at Easat Bethal including my Great grandparets Loren and Zelma Carr. What a great resource. You can get a good idea who was in the area at that time. I found my relatives Mike and Fred Schott and Peter Fickert. I also notice most names listed are men’s names, which makes sense they were the head of the household paying the bills.